We asked Sayakat Cosplay to create a tutorial for us using Worbla’s Black Art and she shared this fun writeup on the process of making a detailed dagger from World of Warcraft! The first step in this build is to draw and size the pattern for the dagger. 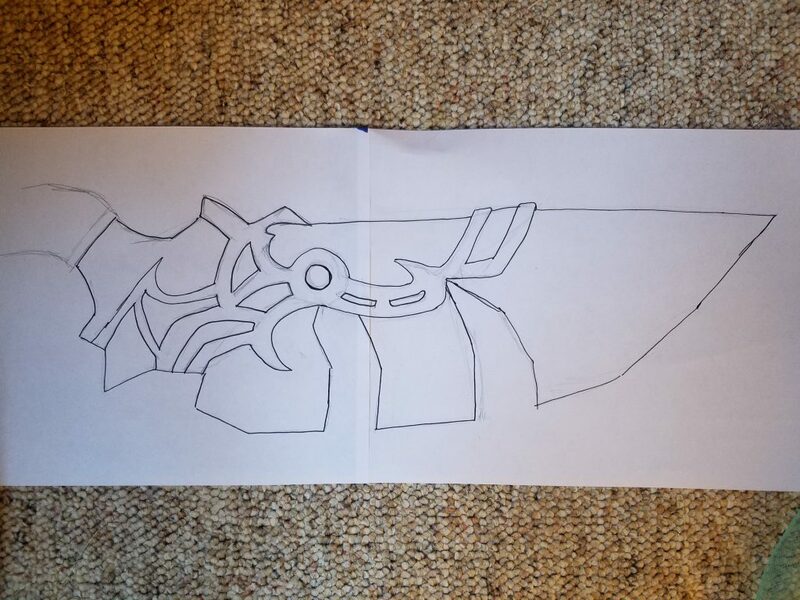 I used a dagger from World of Warcraft as my reference, and altered the design to simplify the hilt, but you can use any reference you like. 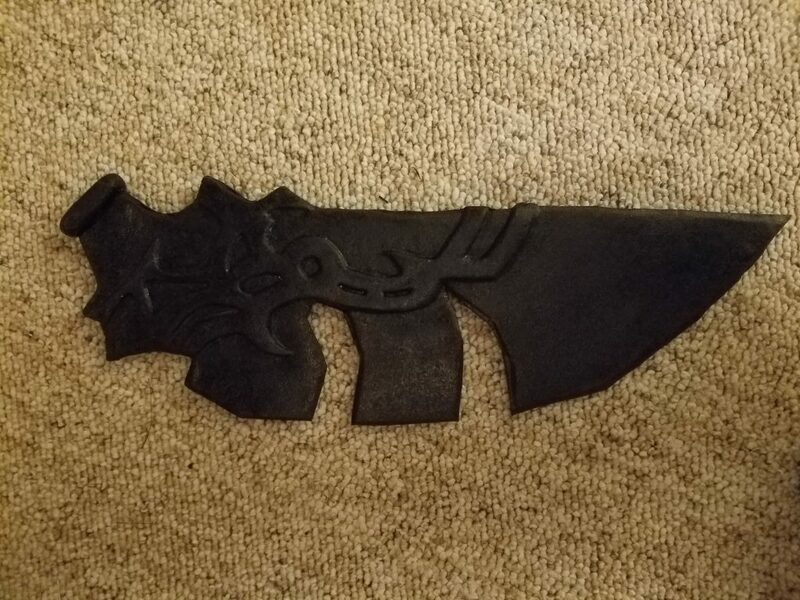 Warcraft daggers are generally actually quite large, and this one is no exception, coming in at approximately 22 inches in total length. It does require a paper pattern first to account for scaling and details accordingly. I draw all my patterns by hand and destroy them in the process of building, so this is one of a kind. Draw out the pattern for your blade, and include all details. The next step is to cut out the base of the pattern in foam. 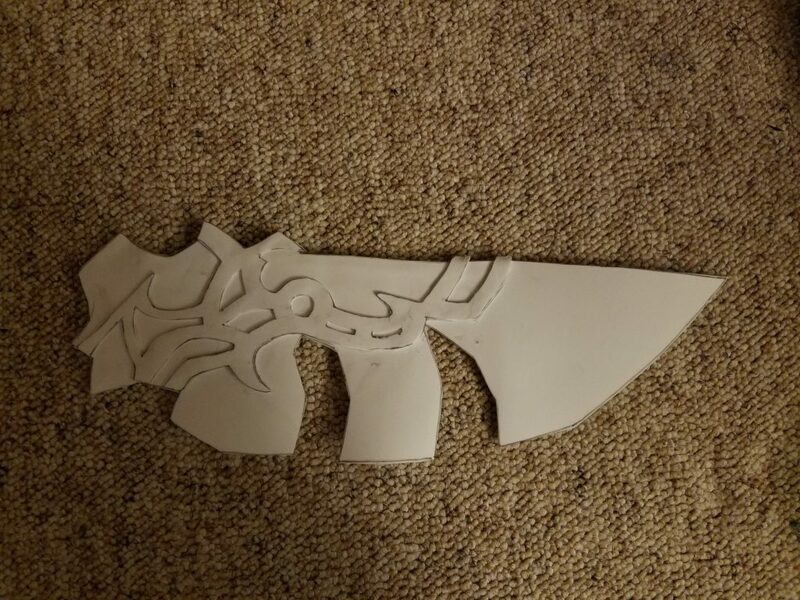 This dagger is 5 layers of craft foam; one base piece, and 2 detail layers on each side. 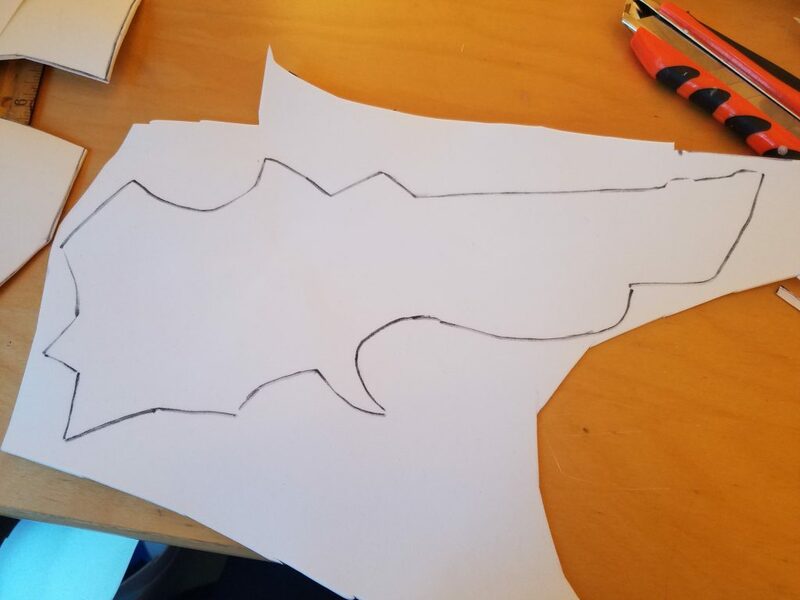 You will need to cut up your paper pattern in order to cut out all the detail. Trace around the whole pattern once to get the base piece. Then cut off the blade pieces from the pattern, and trace the remaining shape onto foam as pictured above. 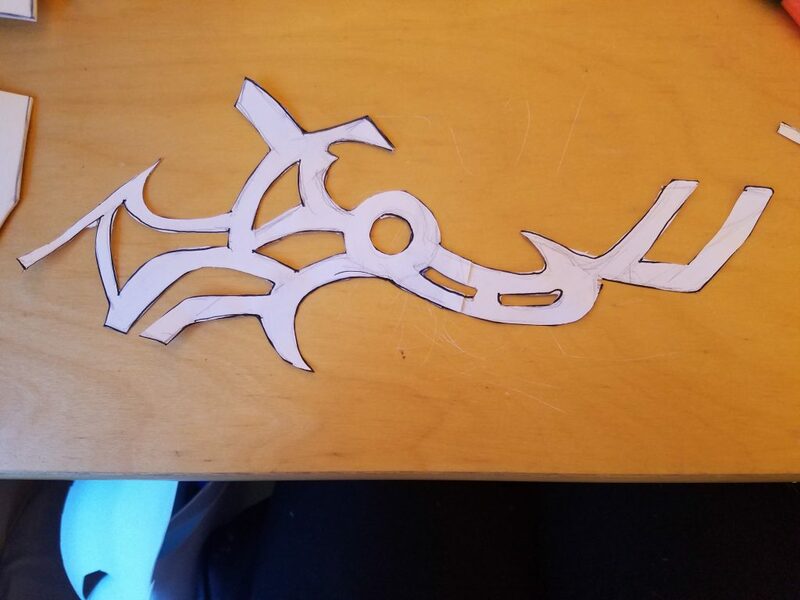 Finally cut out the details, using scissors and the exacto knife, and also trace that onto foam. Once all pieces have been traced onto the craft foam, cut them out. Next, take your hot glue, and glue all layers together to create a foam sandwich. If there are any edges that do not line up, trim them with scissors to get your foam core. The next step is to cut out pieces of worbla slightly bigger than your piece. It needs to be bigger in order to fully cover all the edges. Cut one piece for each side. Save the scraps for the handle piece! Once cut, take one piece and start to heat it with a heat gun. I recommend wearing gloves for the part, as worbla can burn your hands when hot. Using even passes over the surface of the worbla, heat up the whole piece until it becomes soft. Carefully place it over the craft foam, and reheat it a bit to start to mold it into the details. Flip it over and place the other piece of worbla over the other side. Repeat the heating process on this piece until it starts to mold into the details of the craft foam. 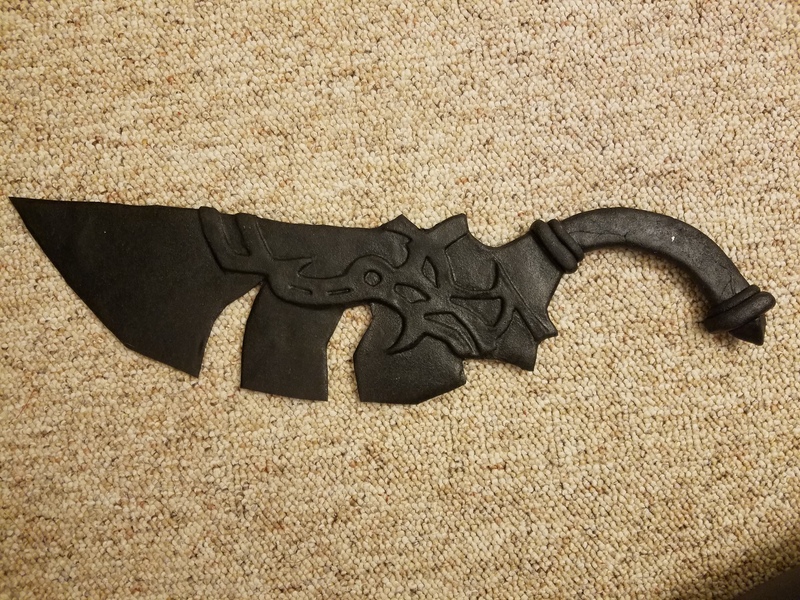 Using a wooden clay tool or other such tool (I actually used a pencil with the lead broken off), carefully push the worbla into the details to bring out all the raised lines. Reheat and warm the worbla as necessary to get the details to pop. Once done with one side, reheat the edges of both sides to cut off any excess worbla from the seams. Repeat the same detailing procedure with the other side. If anything is uneven or needs to be bent, carefully reheat that section, bend and hold the piece until it fully cools and sets. For the handle, cut up and heat small scraps of worbla to roll together into a ball. Once rolled together, roll around in the palms of your hands until the seams of the pieces are no longer visible. Smash the ball down into a rectangular shape about an inch wide, one and a half long, and about three eighths thick. Reheat the base of the blade where the handle will attach, and attach the rectangle shape. For the handle itself, do the same procedure as above, but use a lot of scraps and heat the worbla into a log. Roll it out to a log about an inch thick and 6 inches long. If you need more scraps, heat and roll them into the log. Once the roll is big enough, flatten out the log until it is a little over an inch wide and a half inch thick. Reheat the base of the blade, and the end of the handle that you are attaching to the blade, and stick together. Since the worbla log was so thick, it will take awhile to cool. Make sure to hold it in the shape that you want while it cools. The end of the pommel can be made using the same techniques as above, shaping scraps into balls and shaping accordingly. The joints of the handle and the blade and pommel were reinforced with small worbla snakes. The whole process is a lot of heating, shaping, and waiting, but the end result is pretty neat!